How do I find the correct size for my dog? What method of payment are accepted by Poshpupboutique.com ? When will payment be taken from my account? Are my card and personal details safe? Are prices inclusive of all taxes? Do I need to be available to sign for my delivery? What happens to non-deliverable / refused and unclaimed orders? Why have I have only received part of my order? What if the item I have received is faulty? What if I buy the wrong size? How do I wash my garments? 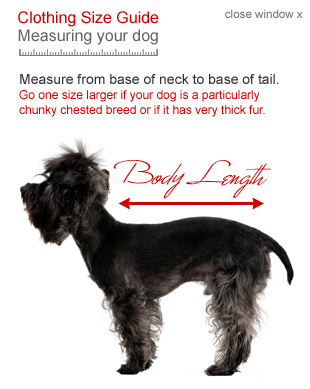 Click here to view our dog sizing guide. Should you need any assistance with selecting the right size, please contact us and we will help you. Dog collars are measured by neck circumference. This measurement is taken from the circumference of the neck where the collar will sit. Registering with Poshpupboutique.com helps make the ordering process as quick and easy as possible and allows you to keep track of your orders online. Though you can checkout without registering by clicking the 'Express Checkout' option. No. You will receive marketing material if you sign up to the Poshpupboutique.com newsletter. The newsletter is optional and you can be removed from the Poshpupboutique.com mailing list at any time. You can request a password reminder on the 'sign in' page. Poshpupboutique.com accepts: American Express, Visa, Visa Electron, Maestro / Switch, MasterCard, Solo and Laser. When you reach the final billing stage and press ‘Pay Now’ Poshpupboutique.com will immediately contact your bank / card issuer for authorization to take payment from your account. If the payment is authorized you will receive an e-mail within a few minutes confirming your order and a payment will be taken from your account. Your browser will go into secure mode as soon as you access the 'checkout' or 'login' pages, before you enter any personal or payment details. You can check that you are shopping in a secure environment by looking for either a locked padlock or a key icon in the grey bar at the bottom of your screen. Being in 'secure mode' means that all of your details are encrypted to keep them secure. Encryption creates billions of code combinations to protect each transaction made on our site, so your card details cannot be viewed by anyone else using the Internet. If you are using one of the more recent browser versions, our site supports 128 bit encryption and therefore keeps your details as safe as possible at all times. No credit or debit card details are stored once your order has been processed. This is why you can save your favorite delivery address but need to enter your card details each time you order. Where products are delivered to you outside of the European Union you will be responsible for paying any local sales tax or import duties arising at the delivery destination, which are not included in the price of the products. Prices are quoted exclusive of postage and packing, which will be charged at the rates specified during the checkout process, before you complete your order. Within the EU all prices are inclusive of taxes at the rate appropriate to the country of receipt. The total cost of the order is the price of the products ordered plus the delivery charge where applicable. Delivery costs and estimated delivery times will be advised during the checkout process. Simply use the 'search' link on the website and type in the product code or a description of the item you are looking for. Or use the links at the top of this page. We aim to dispatch your order the same or next working day, and delivered to you within 1-3 working days for the UK, 2-4 days for mainland Europe or 4-6 days for the rest of the World. Though please allow up to 28 days for delivery. If the item is of a higher value a signature will be required, we will advise you by email in advance if that is the case. For all other items the carrier will leave a card informing of the attempted delivery, this card will also include instructions on how to obtain your parcel. If any order is returned, refused or unclaimed by the customer due to customer refusal, negligence or absence, or the provision of incorrect shipping information we shall attempt to contact you. However we reserve the right to recharge all shipping costs to enable us to resend the order. If your order status is 'Awaiting Dispatch' then it may be possible, to request a cancellation, please contact us. Every effort is made to dispatch your order correctly and promptly, unfortunately, occasionally errors can occur. If the item you receive is not what's detailed on your order, please contact us, quoting your name, address, contact and order details. All items are dispatched together in one package so if you have not received all of your order it will be because the remainder of your order was out of stock at time of ordering, you would have received an email advising of this at time of order so please check your spam / junk mail folder. If you receive a damaged or defective item, please contact us, with the order number and the product condition within 24 hours of receipt to obtain an authorization number for returns. Unauthorized returns may be refused or disregarded. Damaged / defective items delivered must be returned to us securely packaged and wrapped along with the returns authorization number. After we receive the product, we will examine and test the defect of the item(s). If we find the defect described in your email, we will ship you a replacement for the defective item(s). Otherwise, the original item will be shipped back to you. Damaged / defective items delivered must be returned to us securely packaged and wrapped along with the returns authorization number. After we receive the product, we will examine and test the defect of the item(s). Goods returned for any other reason must be in pristine condition with labels attached and all original packing in tact. In order to return goods you must first contact us and return the goods within 14 days from receipt of the goods. Poshpupboutique.com will refund the purchased price of the item(s). Poshpupboutique.com reserves the right not to refund item(s) that are not returned in a re-saleable condition. We guarantee to refund any item you are not completely happy with when you return it to us by post, in a saleable condition within 14 days of receipt. If you purchase an item that is the wrong size we will exchange it for another size (or give a refund if no appropriate size is available / exists) providing they are returned in an unused condition. Additional postage costs at the same rate as your original order may be applied. With this in mind we ask that you please measure your pet correctly before placing an order. Should you need any assistance with selecting the right size, please contact us and we will help you. We recommend that you send your return via registered post as we are not responsible for lost returns. We advise that all items (with the exception of carriers) are hand washed separately in warm soapy water, reshaped and allowed to dry naturally.